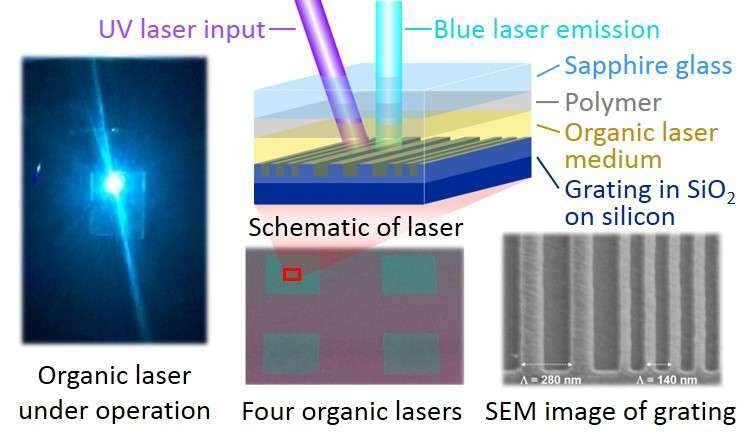 Photograph of a blue organic thin-film laser under operation along with microscope images and a schematic of the lasers. By optimizing the device structure and using appropriate materials, the duration of lasing was extended up to 30 ms, which is more than 100 times longer than previously possible. The schematic is a generalized representation of the structure and is not to scale. Credit: Atula S. D. Sandanayaka and Willam J. Potscavage, Jr.